You are here: Home » Learn & Live the Faith » Apologetics » What Is Social Justice? According to the Compendium issued by the Holy See in 2004, “the primary and fundamental” core principles of Catholic social doctrine are “the dignity of the human person, the common good, subsidiarity and solidarity.” All other authentic expressions of Catholic social justice stem from these “permanent and universal” principles. Simple enough, right? And yet, the following year, the USCCB published its own document presenting the “heart” of Catholic social teaching which includes such “key themes” as “Care for God’s Creation” (along with a reminder that “Care for the earth is not just an Earth Day slogan”), while failing to mention the authentic foundational principle of subsidiarity even once. Inadvertent oversight? You decide. Pope Leo XIII, whose seminal 1891 encyclical, Rerum Novarum, is still the gold standard for articulating the fundamentals of the Church’s social doctrine, wouldn’t even recognize as Catholic much of the “social justice” drivel bandied about nowadays, some of it from ostensibly reliable sources. Consider, for example, the letter sent to Congress earlier this year in the name of the bishops’ conference calling for “raising adequate revenues” (a phrase that every politically literate American recognizes as liberal-speak for “tax hikes”) before going on to give the impression that the single greatest champion of human dignity and charity on the planet is the Obama led Federal government. Apparently the authors of this Democrat-policy-position-paper-on-USCCB-letterhead are unaware of some important facts: namely, that the high distinction just mentioned belongs to the Roman Catholic Church alone, that taxation is no substitute for the demands of social justice, that one would be hard pressed to find a more grossly inefficient and wasteful middleman for facilitating the flow of aid to the needy than the Federal government, and most critical of all is the fact that one of the first Executive Orders to come out of the current Administration is aimed at sending millions of dollars in taxpayer money overseas to fund abortions under the guise of humanitarian aid. With the selection of Rep. Paul Ryan as Mitt Romney’s running mate, renewed attention is being paid to the topic of Catholic social doctrine, and so one would do well to ponder what “social justice” truly is. First, let’s consider the word “social.” It simply means “of or relating to cooperative, interdependent relationships and associations among human beings.” Remember that word “associations.” It will come up again. The meaning of “justice,” on the other hand, is not so simple, and this is where the rubber hits, or in many cases leaves, the road. The classic understanding of “justice” is “rendering to every man his due,” but what exactly is man’s due? According to the liberal worldview, man’s due is a function of unfettered freedom manifested largely in the so-called “right” to seek pleasure without moral restraint or judgment. At its worst this false notion of justice becomes the weapon by which another man’s freedom is taken; extending even so far as to consider it “just” to take an innocent life through abortion, euthanasia, or the destruction of human embryos for medical purposes. This twisted view of justice is sometimes invoked to promote an artificial notion of equality under the guise of “fairness,” thus overriding the legitimate uniqueness of individual human persons. This can be discerned in attempts to downplay the connection between skill, effort and outcome in society; e.g., in educational systems that shun traditional grading methods, or in “competitions” that deem everyone “a winner,” or in economic systems that divorce production from remuneration as is so often the case when collective bargaining is employed. At its most egregious we see this manifested in statist systems of governance that force redistribution of temporal goods, sometimes even going so far as to reject the right to private property. All of these initiatives misnamed as “social justice” have a common, and perhaps surprising, theme; they are built on the assumption that rendering to every man his due is ultimately defined, though not always explicitly so, in terms of the avoidance of suffering. To many, much of what has been said thus far about the liberal secularist view of social justice can seem somewhat admirable at first blush: freedom; equality: fairness, the avoidance of suffering, etc. This approach is untenable at its root, however, because it is born of an unwillingness to embrace the fact of the human condition; i.e., it is unwilling to accept who we truly are. We are created beings, body and spirit, beholden to the Creator in whose image we were made. We are endowed with a free will indeed, but one that is duty bound to the Divine Law above all else. We are beings of equal dignity one to the other, but we are also uniquely endowed with God’s gifts such that no two are alike. Furthermore, we are uniquely dignified among all creation thanks to our unique relationship with the Creator, and therefore of inestimable worth, but we are also fallen and sinful and destined without exception – in this life – to suffer and die. This latter truth of the human condition – that all must suffer and die – is of paramount importance in conceiving of “justice” rightly. When we embrace the reality of human suffering as it relates to justice, not only are we coming to terms with who we are; we are also coming to terms with who God is. Human suffering has always had this effect on humanity, moving us to question the meaning of life: Why do we suffer? How can God allow such things? Is God not just? The reason the world struggles so mightily to understand justice is simple: the world has rejected the reality of sin. Indeed God is just, and His perfect justice allows suffering in order to redeem the sinner. It’s actually quite simple: the failure to recognize sin is the failure to recognize justice. Pope Benedict XVI wrote in his 2010 Lenten message, “Christ is the Justice of God.” It follows, therefore, that a failure to recognize Christ is a failure to understand justice, and vice versa. “Evil men do not understand justice, but those who seek the Lord understand it completely” (Proverbs 28:5). Christ the King is justice and His laws are just. Reject the Lord’s sovereignty and circumvent His laws, and justice is utterly impossible. Mercy, love and truth as revealed in Him alone is what constitutes true justice. The discussion is not easy, nor is it void of danger. It is no easy matter to define the relative rights and mutual duties of the rich and of the poor, of capital and of labor. And the danger lies in this, that crafty agitators are intent on making use of these differences of opinion to pervert men’s judgments and to stir up the people to revolt (RN 2). The teaching found in Rerum Novarum is as relevant today as ever in combating the errors of the world. The agitators are agitating with remarkable tenacity! Pope Leo went on to give us valuable core principles that form the basis for Catholic social teaching. We need to know and embrace these core beliefs or we run the risk of being misled. The true worth and nobility of man lie in his moral qualities, that is, in virtue… Christian morality, when adequately and completely practiced, leads of itself to temporal prosperity, for it merits the blessing of that God who is the source of all blessings; it powerfully restrains the greed of possession and the thirst for pleasure (RN 24, 28). Pope Benedict went on to say in his Lenten message, “Above all, justice comes from grace…” Get that? Social justice lies in the fullness of morality as defined by God, not as calculated by majority rule. It is a function of grace, not government. Returning where we began, the frequently overlooked principle of subsidiarity tells us that human needs are best met by the smallest possible unit of society – the individual, the family, the parish, the community, etc. We must therefore be weary of excessive government control as statist solutions to human problems are no substitute for the demands of individual responsibility, and that applies to both giver and recipient alike. 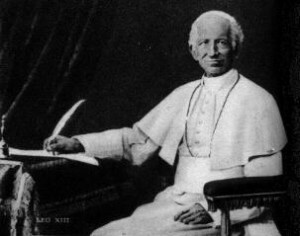 In Rerum Novarum, Pope Leo XIII pointed to the freely formed associations of men in response to the demands of social justice no less than 48 times, and he pointed to the State as the servant of the people who form them. The greatest of all “associations” on earth is the Catholic Church simply because she is much more than simply human: she is the Body of Christ the King, and the State, if true justice is to prevail, must govern according to her laws.